The legend further says that once a son of British officer was walking on the beach with his dog. He threw a ball for the dog to fetch. The dog ran to get it but came back without the ball and was very frightened. The British officer asked his Hindu servant to go see why the dog was frightened. The servant saw a giant person with huge braided hair on his back. He immediately recognized that the Lord Shiva was sitting there. He came back and told what he had seen. An excavation followed and found the temple “cave” under the ocean. The temple was created and is still preserved. Our caravan of 30 people and 10 cars left the Shrine to go to the campsite. 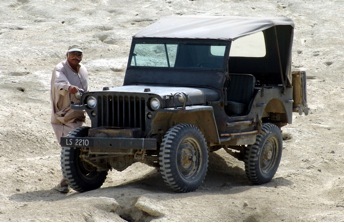 If you have been on a Dune buggy in sand dunes you would visualize what fun it is to go up and down in the sand dunes and seeing the Jeeps and SUVs get stuck in the sand! Run of the mill jam in the sand dunes! 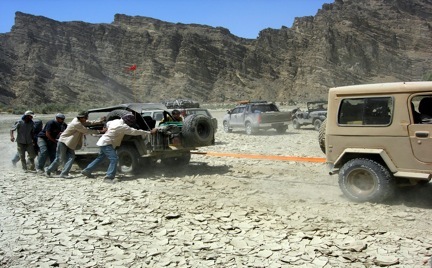 The Offroaders were all prepared with a motorized winch and it was amusing to watch the winch do its magic and with little heave-ho get the vehicles out of the sand! 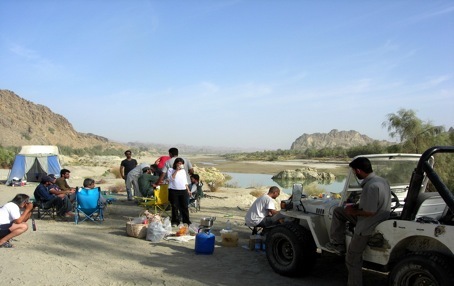 By the time we reached the camp site the Sun was already setting and we had to rush to set up 10 plus tents. After that a fire pit was prepared and a cook who had come with us prepared the dinner for everyone. For me a vegetarian dinner was prepared already. If you have ever done camping then you would know the joy of cooking under the clear sky, staring at millions of twinkling stars and sitting in a circle around the fire pit and chatting about anything and everything! The camaraderie that one builds around the fire pit is very unique and one needs to experience it. Being a city guy I have not experienced the true Mother Nature with millions of twinkling stars except on some camping trips. This was the most humbling experience to realize how small (not even a speck) we are in the scheme of the Universe created by God and yet we feel that we are the creator – what a solid fallacy, indeed! As the night wore on we retired with our sleeping bags in our tents. Early in the morning around 5 AM I had to go to for bathroom. I had totally forgotten that I would not have any western style commode in this wilderness. Neither did I have toilet tissue roll nor did I know how to seat in a perfectly balanced squat style in the wilderness. It was an interesting experience to hold on to some brushes, remain balanced while squatting, and use of old newspaper instead of a tissue roll. I think I would rather have had a western commode and toilet tissue paper roll for sure! Around 6 AM everyone was up and moving about with fresh aroma of tea and coffee being made by the cook. Seventy years young Pappu Saheb was using the mirror of his 1947 Jeep for shaving and was boiling two eggs for him. By now we were all fresh and had some tea and breakfast before we left on the adventure again. Before I left the hotel I had taken a whole basket of fruit with me. I am sure that the divine hand of Pujya Annaji made me do that. It was the Ekadashi day (eleventh day of the Hindu Lunar month) and one is to sustain only on the fruit on that particular Ekadashi. It was Paapmochini Ekadashi – Paap means sins and Mochini means that which cuts. So again I had another day of gaining Punya by sustaining only on the fruits and cut my some more of my leftover sins. Coming back was also an adventure. The Doc (Crocodile Dundee) who used to help everyone else with his tools to unstick other vehicles had his own car get stuck and that not in usual sand dunes but on dried mud patches on the River bank. We all had fun teasing him about his driving abilities! The Doc gets stuck in mud pies! Finally we all got going and at a great spot we stopped and lined up all 10 cars in one line and the occupants of the cars had to stand in front of it to take a grand group picture. It is indeed a memorable picture. It is a picture to be seen. This “Sangh” of Pujya Annaji was far better than Jashwant Singh’s (an ex-minister of the Central Government of India) Kafla (group) that he took on his yatra to Hinglaj few months earlier with heavy police and military escorts and lots of media coverage as an historic trip. Guru’s protection is far mightier than all these police and military escorts! 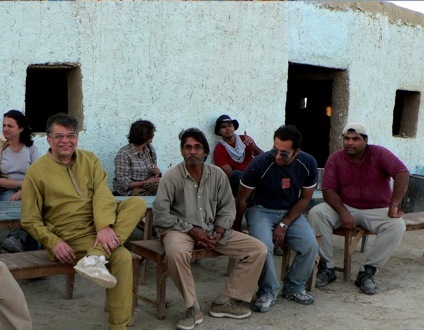 Group picture – Author is at the left most in golden color Kurta. 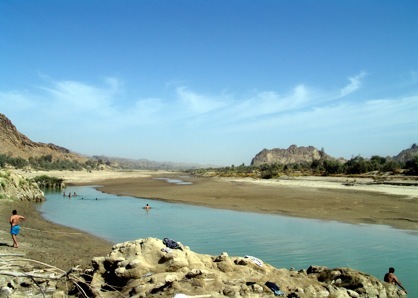 On the way back to Karachi we made two stops. First stop was at the two “hills” that I mentioned earlier. 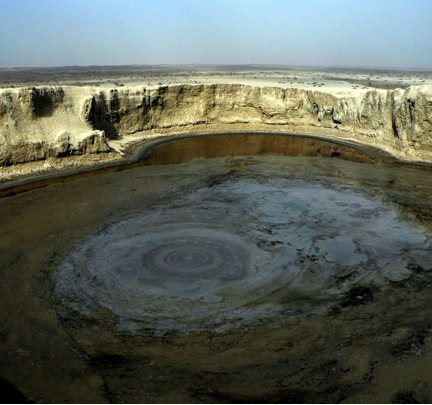 They are actually world’s largest live mud volcanoes. It actually spits cool mud which streams down from the top to the bottom of the hill. 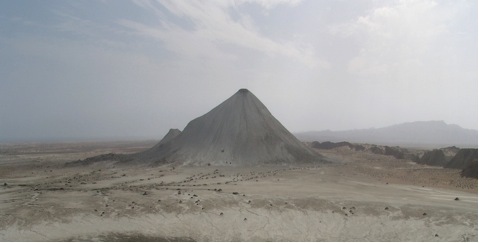 The large volcano is named Chandragup (or Chandragupt) and the smaller one is called Rani. The younger folks had fun running up the Chandragup (pretty steep and tall) while more adventurous folks took their Jeep, in reverse, on the slopes to go to the top. 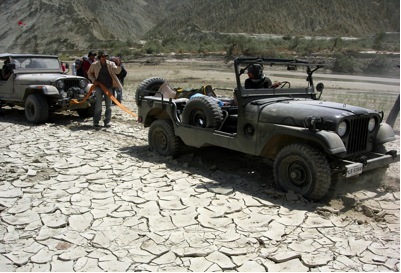 Jeep going up in the reverse gear! Someone told me that one of the fellows did fall in the mud at the top of the volcano. I am sure he had a real cool bath! 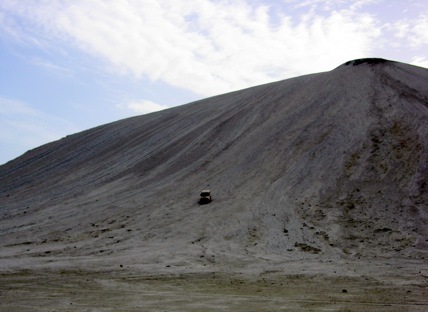 I stayed safe and climbed up the smaller Rani volcano to the top. It was amazing to see the bubbling mud on the large opening of the volcano. The escaping Hydrogen Sulfide gas created big bubbles making it look live lava. This is a site to be seen. Legend has it that one has to drop a coconut in the volcano. If it comes back then it is a proof that the person is a kind person with clean and good heart – a pious person, if it sinks then….stay away from the person! I think Pujya Annaji wanted me to do more Punyas before I can take this test and not embarrass me in front of my newly found friends and brother Hamid and hence had made me forget the twelve coconuts at the hotel! By this time it was almost 3 PM and we headed back to Karachi with an obligatory stop at the tea stall (Dhaba ) for a refreshing cup of tea while watching the beautiful red sun setting in the horizon and mulling over the incredible experience. Nothing else can compare to this incredible pilgrimage made against all odds but made so easy and simple by grace and blessings of Hingula Devi, my Guru and Gurumata, support and blessings for my departed dear parents, my dear wife and kids, and other devotees..
Next day I left on PIA for Mumbai. As I mentioned earlier, the person who took my movie at the Shrine was waiting for (on his off day) at the airport to whisk me through the immigration and customs formalities! On the flight I sat next a couple who was going to India to see their relatives and chatted about their fond memories of India before the partition in 1947. As a closing note I want to express my gratitude to my Guru and Gurumata for making this incredible pilgrimage a smooth and memorable experience and giving me my brother from past life Mr. Hamid Omar. 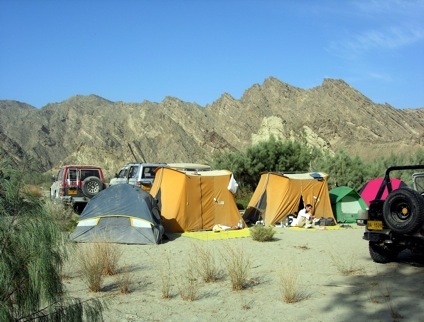 I thank the entire Offroaders club members, in particular to Mr. Salman Ali for the warmest invitation email and Mr. Khalid Mahmood for their fantastic hospitality. Importantly I want to thank my dear wife Anu, my daughter and son Meera and Sameer who whole heartedly supported me in this adventure to an unknown and possibly dangerous territory. Without Anu’s support and her faith in Guru this would have been very difficult yatra indeed. One does not/should not ask anything from Guru and God; they will give you/have already given more that one’s qualification. This pilgrimage proved that one’s unflinching faith in one’s Guru & God makes anything and everything possible and totally effortless. 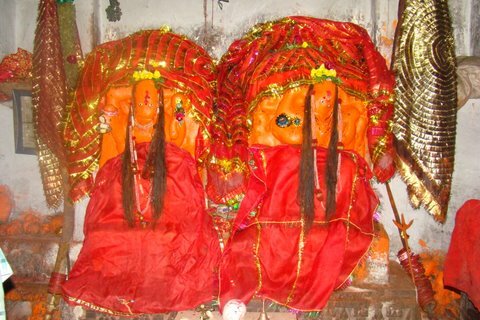 May you have the blessings of Mata Hinglaj (Nani Bibi), Pujya Annaji and Pujya Akkaji.